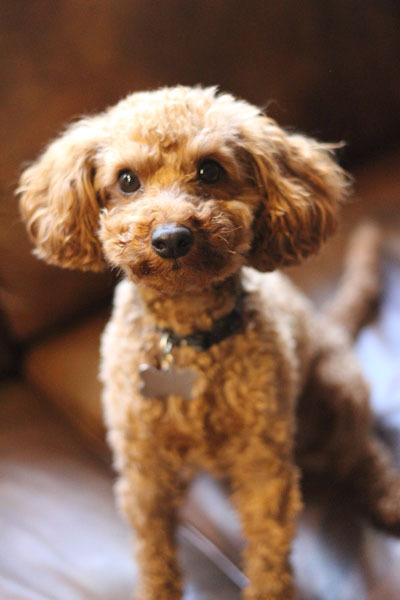 “Copper” is our miniature poodle stud. When our previous stud Flame was getting older we began searching for a replacement for our gorgeous coated red stud who has thrown exceptional coated pups. We wanted our future stud to have the same dark red soft, thick, silky hair that he had. When Lynn called Marsi Shore at West Coast Poodles in Escondido. Marsi mentioned that a particular stud she had throw pups with exceptional hair. It turned out that her stud and our Flame had the same dad. It was a miracle since they had come from Canada and we had gotten them from breeders that were thousands of miles apart. Needless to say we had found the breeder for our next stud who is everything we had hoped for. Copper has had all of the tests done recommended by our veterinarian. His heart, hips & hip joints as well as his patellar luxation checked out good! He was deemed “good to go”! There have been no health problems in Copper’s family history. Copper is 12″ at the shoulder and weighs in at 8 pounds. Copper and our retired stud “Flame” are half brothers and both have that gorgeous coat of hair that is soft, thick, silky and a gorgeous shade of red. Copper lives with his guardian family in Sebastopol. They have raised Copper extremely well. He has a wonderful temperament and is very intelligent and well trained. He is a sweetheart and very affectionate. Copper was an only child until recently and now has a set of human twins that he will get to spend time with. Copper is very affectionate and knows so many tricks and commands that his guardian family have taught him. We are thrilled because he throws all Golden colors ranging from light cream, golden, apricot all the way to red! 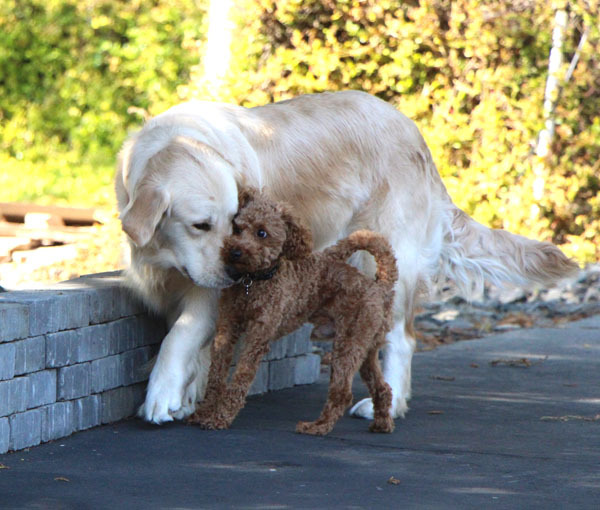 We are thrilled to have Copper as our Mini GOLDENdoodle “dad”!